Lord Ganesha is known as Mangalmurti. Worshiping lord Ganesha removes every problem. 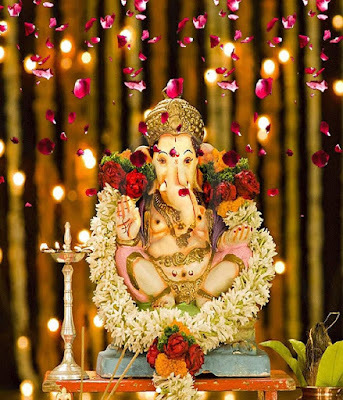 Worship of lord Ganesha is extremely beneficial for child, education and luck. This removes inauspicious yoga from horoscope. Worship of lord Ganesha is easy and it can be done with leaves. There are different color and fragrance of leaves. Every color and fragrance relates with different planets and problems. Leaves can be offered to lord Ganesha with different psalm. Desires can be fulfilled if leaves are offered with special ways. Offer leafs to Ganesha on any day of Ganesha mahotsav. Take bath in morning, light ghee lamp and sit in front of lord Ganesha. Offer modak to Ganesha. Offer different leaves with different psalms for your wishes. Offer nine leaves once at a time. One can offer 108 leaves. High Position: Chant “Ganadhishay Namah” and offer Bhangraya leaf. Progeny: Chant “Umaputray Namah” and offer belpatra. Health: Chant “Lambodaraya Namah” and offer ber leaf. Work Barrier: Chant “Vakratunday Namah” and offer sem leaf. Fame-Prestige: Chant “Chaturhotery Namah” and offer bay leaf. Employment: Chant “Vikataya Namah” and offer kaner leaf. Business: Chant “Siddhivinaykaya Namah” and offer Ketki leaf. Financial Benefit: Chant “Vinaykaya Namah” and offer aak leaf. Heart Disease: Chant “Kapilaya Namah” and offer Arjun leaf. Shani Problem: Chant “Sumukhay Namah” and offer shami leaf. Good Luck: Keep basil leaf in pot or land. This removes negative energy from the home.